The college football analyst comes out with the most-stunning ranking of USC this summer with the Trojans ranked sixth just behind Oregon and ahead of No. 7 Louisville. 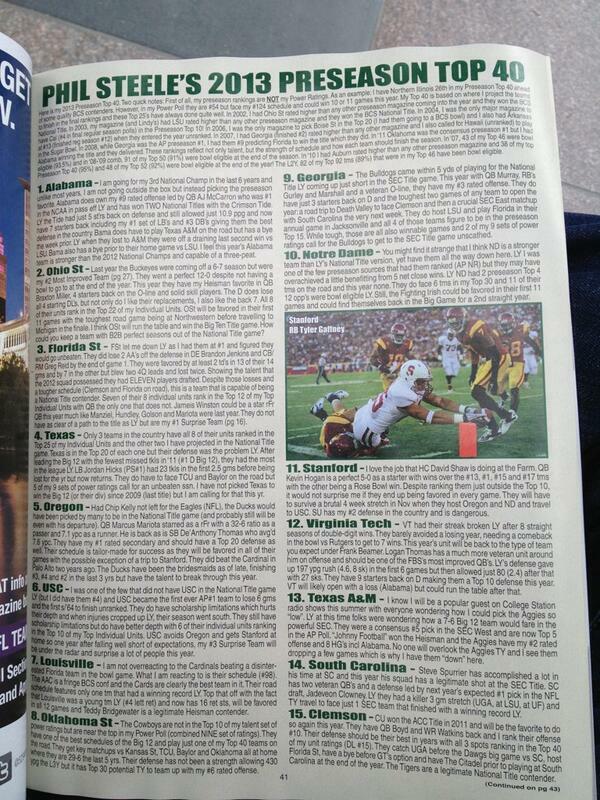 As the picture reveals, Stanford is ranked 11th. Seriously?…. taking a picture of a magazine and posting it on your blog?..How lazy can you get?……Isn’t this some kind of copyright infringement? …..so you’re stunned?…..weren’t we all stunned about last years debacle?….Phil Steele obviously sees something in the team this year that you don’t……How about you try and figure it out?!!! Phil just pissed in the wolfman’s cheerios….hahaha! this sounds more like Leonard Tose’s Pre-Season Top 40!!! i think the wolfman took a picture ’cause otherwise no would would BELIEVE IT!!! well, this wasn’t exactly from One to UN, but i’m sure Bounce Pass wanted to start out in the 25-30 area so expectations were not too high!!! thanks for the GUMBALL, Phil!!!!! Dude… that was way too easy and way too predictable….. I LOVE IT!… I’m feeling so tingly! BELIEVE it?…. why wouldn’t we believe it?….it’s just one persons opinion….Like in 2011, when 59 out of 60 AP voters picked LSU as the #1 team in the country, and the lone holdout was none other than Wolf, who insisted on picking Boise State #1…..and Wolf justified his selection based on historical data (their wins over Oklahoma,Oregon, Virginia Tech, and Georgia) ,,,, from PRIOR years!!! !.BTW..by him taking a picture, Wolf just saved me $10……Leonard Tose?.. another Jim Healy reference from the 70’s and 80’s…..How about some originality?….you’re better than that, aren’t you?…..I’m sure that UCLA QB Brett Hundley will have a Heisman Trophy worthy season this year, no? For old time’s sake, I guess. make that two crotch kicks!!! LOL. Good luck with that! From 6 to UN isn’t much better than 1 to UN! Still showing off your lack of football IQ, TFail? Keep drinking the Koolaid, I guess. That is incredible with no experienced quarterback, one decent experienced but injury prone running back, our questionable offenisve line and our Swiss cheese defense. True, nobody good will play us with Texas A&M even wimping out. Leinart had Norm Chow as his OC and had Reggie and LenDale to hand off to. Our quarterbacks have Lane Kiffin. in other unexpected news, the Nobel Committee in Stockholm Sweden named T-Fail a Nobel Laureate in the field of Penises and Gay Fantasy based on his incessant comments on these two areas of study. wow so witty!!! repeating what i said!!! such an underused tactic!! to think most people abandon this in the 3rd grade!!! well done, dummy!! oh great, now I’M guilty of mocking a mentally challenged boy. I think you’re missing something……hahaha!